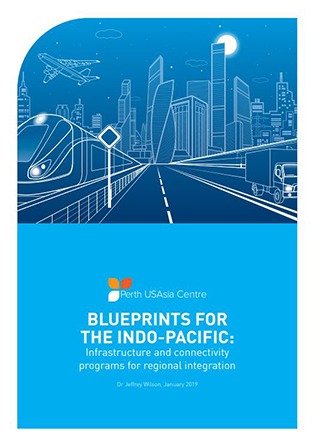 Cross-border infrastructure is critical for the development of the Indo-Pacific region. While intergovernmental economic agreements provide the institutional architecture for regional integration, physical infrastructure is needed to connect economies via road, rail, shipping, energy and telecommunications links. The Indo-Pacific is currently plagued by a range of ‘infrastructure gaps’ which constrain the economic development of the region. Estimates suggest that $1.5 trillion per annum of new infrastructure investment is required to close these gaps. In recent years, many governments and regional organisations have directed their attention on infrastructure and connectivity (I&C) issues. Since 2010, six new I&C initiatives have been launched in the Indo-Pacific, and two pre-existing institutions have been upgraded. These initiatives are functionally differentiated, offering contrasting institutional architectures, governance frameworks, financing models and strategic orientations. These new I&C initiatives offer much needed ‘blueprints’ to guide regional connectivity. They collectively promise over $1 trillion of capital to the region’s infrastructure funding pool, and provide dialogue mechanisms to augment inter-governmental cooperation. However, they also pose geostrategic risks. Infrastructure has become a new front in the contest for regional leadership, as major powers have competitively used I&C initiatives as a tool for diplomatic influence and leverage. Indo-Pacific governments – on both the donor and recipient sides – now face an ‘infrastructure choice’. With a finite supply of financial and political capital, they will need to carefully allocate their efforts. Key considerations include appropriate institutional mechanisms, the design of governance arrangements, the involvement of the public versus private sector, architectural and membership issues, and the management of geostrategic tensions. Governments must now make informed choices that balance opportunities and risks. It will be important to establish a division of labour between the initiatives, foster cooperative mechanisms that combine their respective strengths, and develop strategies for managing geostrategic concerns. This report is authored by Dr Jeffrey Wilson, Research Director at the Perth USAsia Centre. It is the first report of the Centre’s Blueprints for the Indo-Pacific research project on the geoeconomics of regional connectivity.